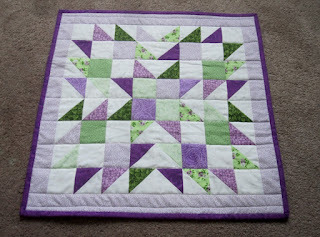 Since the Schnibbles monthly parade of little quilts is no longer, there is now another blog quilt parade of the month called "Minis and More." I never took part in the Schnibbles because I didn't want to commit to making a little quilt each month. I didn't know what I'd do with all those little quilts. However, while blog surfing, I came across this pattern for Minis and More and since I have way too much fabric, I decided that I could use this for something. It will be a table topper for my coffee table. I love the colours. The Minis and More is hosted by Sherry from A Quilting Life and Michele of Island Life Quilts. Pop on over to find out more and also to see different versions of the same pattern the Summer Star Mini. Love it. I love your purple/green choice. Thanks for the link. What a happy little mini! 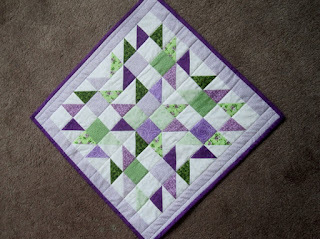 Thanks for posting to TN&TN's WIP Wednesday, Dolores! So pretty! 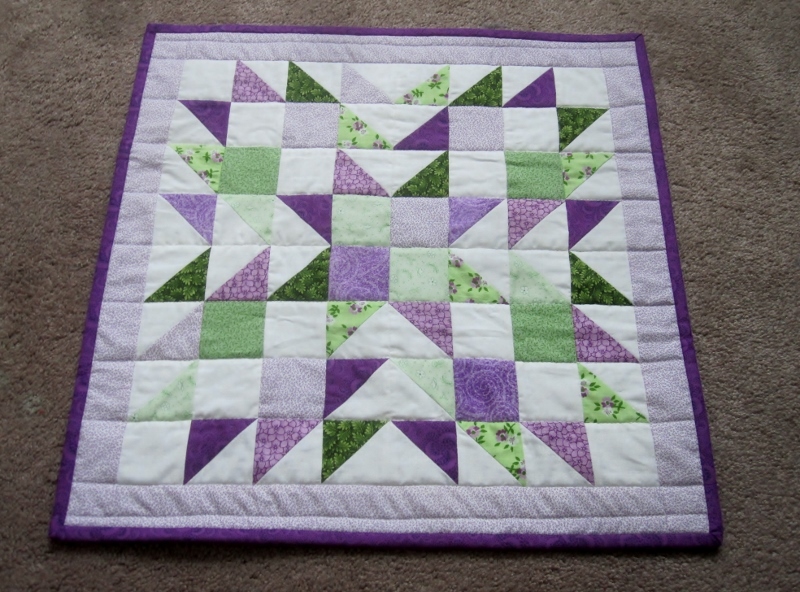 Your quilt makes me think of a summer coffee table under some lilac bushes. They are in full bloom here right now. Hi Dolores! Your Summer Star is beautiful! I'm glad you joined in. I hope you will email Sherri or I so we can include your mini in the parade if you haven't already. I'm sure everyone would love to see it! That's cute! All I make anymore are mini's, I have a whole wall filled with them. I just love them. Your Summer Star is adorable! Your color combination is really fresh!